With this program, you can create a financial plan for your children's education. Each child's data may be updated each year as inflation, costs, and other circumstances change. Costs such as tuition, room, books, and transportation can be itemized, and the program automatically adjusts the costs for inflation. The program provides three plans for saving the needed capital. A manual and forms for gathering data are included in the package. Designed for both home and office, this accounting package tracks credits and debits, creates financial statements, and prints checks and invoices. It offers a chart of accounts for recording deposits, withdrawals, customers, and vendors. The program can be used to generate up-to-the-minute financial statements and monthly balance sheets. You can create and print your own checks with Dac-Easy Light. Create budgets with as many as 120 accounts, print checks, pay bills, perform automatic transactions, estimate taxes, and monitor your financial condition with Dollars and Sense. Using five hypothetical scenarios, you can experiment with different liability options and see the outcomes in color graphs. A portfolio manager tracks stocks, and telecommunications software links you to online services. Double-entry accounting functions are computed automatically. Data can be exported to Lotus 1-2-3 and other spreadsheet programs. Onscreen help is available. This package comprises nine integrated programs covering major aspects of home financial planning such as checkbook management, budgets, tax planning, insurance and retirement planning, and portfolio management. It incorporates the new tax-law changes and contains a full-featured word processor. You can store memos on its electronic calendar. Financial data can be exported to Lotus 1-2-3. This money-management software handles as many as 999 accounts and 100,000 transactions per year. It monitors cash, credit cards, and checking and savings accounts. It also prints checks; determines interest rates, loan payments, and amortization schedules; prints reports; displays graphs based on your financial information; estimates taxes; and analyzes financing options. It's menu-driven, it's not copy protected, and it provides password protection and on screen help. This program manages your portfolio. You can update your portfolio by typing in stock prices or by accessing Dow Jones News/Retrieval or the Warner Computer online services via modem. Some report formats are provided, but you can also create custom formats. Onscreen help is available at all times. Quicken features cheek-writing and financial-management options, along with a bill minder that reminds you to pay your bills. The program automatically writes recurring checks, and financial records are updated whenever a transaction occurs. You can generate several kinds of reports, such as budgets, income tax, and expenses. Free telephone support is provided. Through onscreen instructions and an illustrated manual, this program guides you through financial planning for your home. 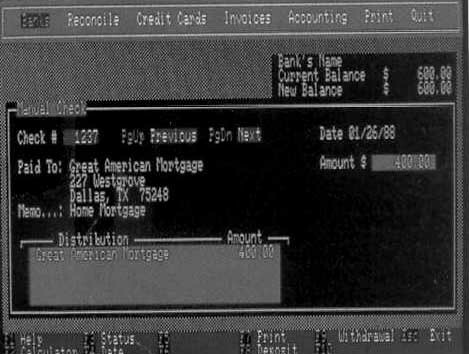 It also features an electronic checkbook that prints checks, maintains balances for five checking accounts and ten credit cards, and performs monthly reconciliation. The program also monitors personal financial holdings, helps prepare tax forms, and generates financial statements. This program tracks, analyzes, and manages investment transactions, portfolios, taxes, and retirement investments. It can notify you of upcoming deadlines and help you plan your investment strategies. Other features include context sensitive help, swiftkeys to quickly access information, customized reports, graphing and charting, and a sideways printing option. The package gives you one hour of prime time on Dow Jones News/ Retrieval Service. The software works with Lotus 1-2-3, Frame­work, dBase II. and other major applications.